If you create a C++ project in Visual Studio and configure it to “Use MFC in a Shared DLL” (the default) you need to make sure the C runtime (CRT) and the MFC libraries are installed in the correct versions on the end user’s computer. That can be difficult. There are three ways to install the libraries on target computers. In this article I focus on the “private assembly” method where the libraries are stored in your application’s directory. Some of its advantages are that you can run the program from any location, even a network share, without installing parts of it to the user’s SxS folder first. And you need not worry about calling VC_Redist from your setup. That is all. Redistribute/install your application like this. Your executable’s manifest (incorporated into your EXE file as a resource) lists the versions of the runtime libraries it requires. The versions listed in the manifest are the initial versions installed on your development machine, though. In the case of Visual Studio 2008 these are the versions of the pre-SP1 libraries. Once you install Service Pack 1 you get the newer libraries in the folder C:\Program Files (x86)\Microsoft Visual Studio 9.0\VC\redist\x86, but the manifest in your own binary still demands the original library versions. That does not work. In fact, it crashes your application when run on a “clean” system. You may wonder what happens if you happily install the most current libraries on your users’s computers and, some time later, an updated version is released by Microsoft. Will your application continue to use the then old and insecure version? Good question! This tells the loader to use the version 9.0.30729.1 instead of the versions 9.0.20718.0 and 9.0.30201.0. Nice, but how does this affect your application with its private assemblies (not tied to the WinSxS folder)? Simple, but effective solution: the loader always looks into the WinSxS folder first. So if your application needs mfc90.dll in version 9.0.30201.0 and version 9.0.30201.0 is what you have installed in your application folder, with the help of the policy file above Windows will load the newer version from SxS nevertheless. Side-by-side searches the WinSxS folder. And if we take a last look, at, for example, Camtasia Studio: its private version of msvcm90.dll is 9.0.21022.8, but when we examine its loaded DLLs in Process Explorer, we see it uses 9.0.30729.4926 from WinSxS. Magic! Some time after implementing the solution described in this article for a medium-sized project I was made aware of a strange problem: on some machines the application crashes while loading before even being able to display any messages. Note: CoreFunctions.dll is one of the DLLs of our product. It is dependent on the Visual C runtime files (including msvcr90.dll) and msvcr90.dll is located in the subfolder Microsoft.VC90.CRT as described in this article. But still, msvcr90.dll is not found by the OS loader. After some research I found out that this happens both on XP (SP3) and Vista (SP2) if and only if the application is started from a mapped network drive. Copying the application’s folder to the local hard drive makes the problem go away. Another way to fix this is to put the VC runtime libraries directly into the application folder, not in the subdirectory Microsoft.VC90.CRT. Activation context generation failed for “C:\Program Files (x86)\sepago\Profile Migrator\CoreFunctions.dll”.Error in manifest or policy file “” on line . A component version required by the application conflicts with another component version already active. Conflicting components are:. Component 1: C:\Program Files (x86)\sepago\Profile Migrator\Microsoft.VC90.MFC.MANIFEST. Component 2: C:\Windows\WinSxS\manifests\x86_microsoft.vc90.mfc_1fc8b3b9a1e18e3b_9.0.30729.4148_none_4bf5400abf9d60b7.manifest. Interestingly, this happened only on one developer’s machine. Checking out a fresh copy of the solution from version control resolved the issue, as did deleting the autogenereated solution files, like .suo or the Release directory. Unfortunately we did not find out what really caused this. thank you for you to make me learn more,thank you??? When inkremental linking is enabled, and one compiles file1.cpp with old vc libs, then install the new vc libs. If you now edit another file2.cpp and link both together, VC++ generates a manifest containing both old and new versions. This happend to us also, but caused no problems. We just had to deploy the newest vc libs to the customers (we use winsxs deployment). This article was rally helpful to me. but I have to ask one question. my Unmanaged VC++ MFC (no .net used, no CLR) application properly running on windows 7 fresh installed computer. but I gives “This application has requested the runtime to terminate it in an unusual way” error in wondows XP sp3 computer. In both way I deployed visual C++ runtime files as private assemblies. What if WinSxS doesn’t contain required assembly? 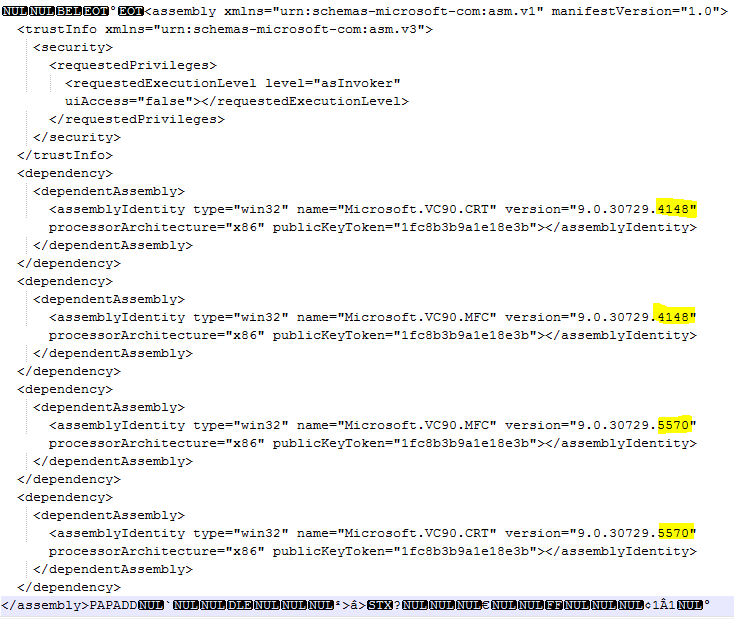 It should load private assembly from application directory, right?